According to Environment Canada all tornado warnings in Saskatchewan have now ended. Funnel clouds were spotted in the west-central part of Saskatchewan and several of them touched down. Three tornadoes have been confirmed in the province in Plover Lake, north of Biggar and Wilkie. 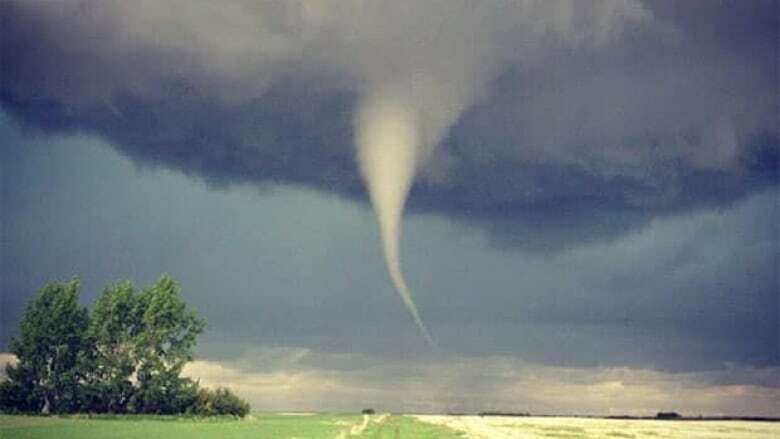 A tornado is a funnel cloud that makes contact with the ground. Earlier Friday there were tornado warnings in west-central Saskatchewan and Saskatoon. Mark Mallet took this video of a tornado near Tramping Lake. A few people said they witnessed funnel clouds in the west-central area of the province. "There was a white strip coming down out of the clouds," said Scott Marshall, who saw six funnel clouds near Luseland. "You can see it, it starts swirling around, you can see it start curving and then you just see it go down and touch." A high school science teacher in Major, southwest of North Battleford, said he watched the sky from the school's front step while students were kept inside. "The length of it would get shorter, then it would get longer," said Chris Williamson. "Then it would get skinnier, then a little bit wider again. There were kids that were driving around during lunch time that saw … ones that darn near touched the ground." Juanita Dueck spotted several funnel clouds from her home near Unity, located about 200 kilometres northwest of Saskatoon. "This one was definitely a funnel [cloud]," said Dueck. "As much of a funnel as you could ever imagine and just kept forming and forming. I watched it for 20 minutes, it was just amazing." She said the school in her area kept the children inside until the storm passed. When Saskatoon was under a tornado warning, hospitals declared a code T, which means staff and visitors were asked to stay inside and patients were moved into the centre of their rooms. Emergency rooms were also cleared to make room for potential casualties. Environment Canada said around 1 p.m. CST on Friday that severe thunderstorms with tornadoes were imminent or occurring in the regions and people should take immediate precautions. You can check out the Environment Canada website for more information on what regions are being affected.